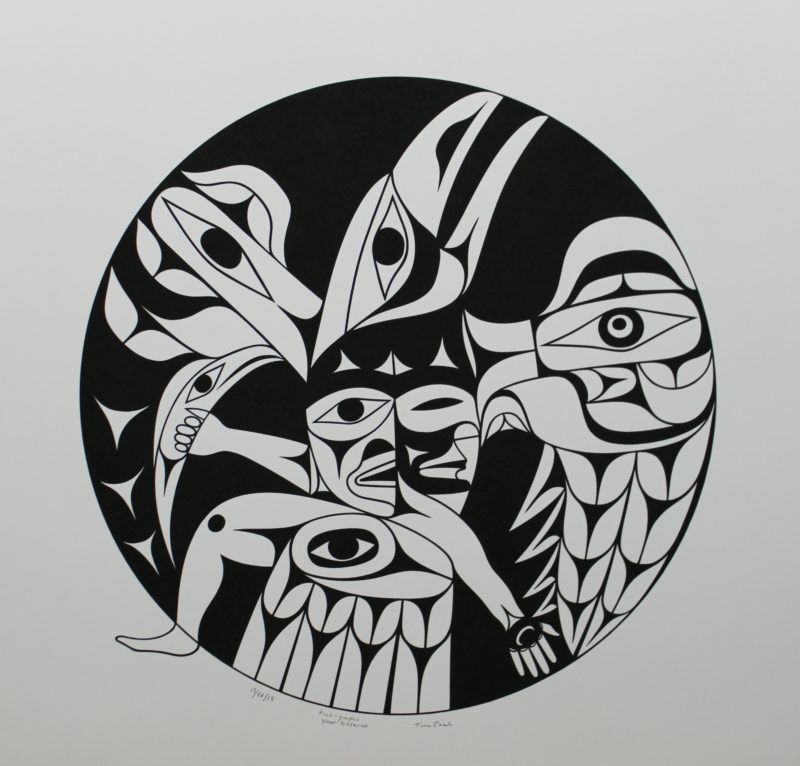 Raven is one of the most important creatures in Northwest Coast mythology and art. He is a cultural focus in many communities and to peoples along the Northwest coast of North America. Raven is cunning. He is a schemer. He is mischievous and curious. He is also a teacher and a spirit. To many, Raven played a significant role in creation, first stealing, then placing the sun, the moon, and the stars in the sky for all to enjoy. With this Raven design, Tim Paul shows the transformation of Raven, going from dark to light. Tim emphasizes that we can’t live without balance in our lives. We can't be without the dark, or the light. Much like the day follows the night, it is a natural occurrence. It is also a concept that has occurred throughout the ages in the history of humankind. Tim says that “In our history, there have been times when we have been in the dark” because of how we have impacted the world around us. We have the power to do tremendous harm by inserting things that don’t belong, yet we are the smallest part of the universe. Tim fears that we don’t respect our place in this universe anymore. There is too much upheaval as a result, and we need to remember that we are all related to each other and to nature. He says, “We come from nature, we grow from nature. Our ancestors were tied into the equinox, the sun, the moon, the stars, the wind, the oceans, the waves, the tides, and the winds. Let’s stop and consider our place in the universe. We have to respect it and put things back in place”. He continues, “We shouldn’t argue about what he have, or don’t have. We should work out our differences”, but most importantly, Tim adds, “We can change”. The central theme of this serigraph is how one can easily be taken to the dark side, but just as easily can come back to the light. Light here represents all things good. Tim says, “Light breathes life. It creates life. Where would the whole universe be without light. The whole of nature. The plants, rivers, trees, and all creatures. Without the light, we’d be absolutely nothing”. In the centre of the design are two faces, one dark (turned to the side), and one light (frontal view). As the transformation takes place from dark to light, we are emerging from the dark (inside the circle), and slowly stepping into the light (foot outside the circle). Tim says, “This is good coming out”. This is taking control and owning our destiny. 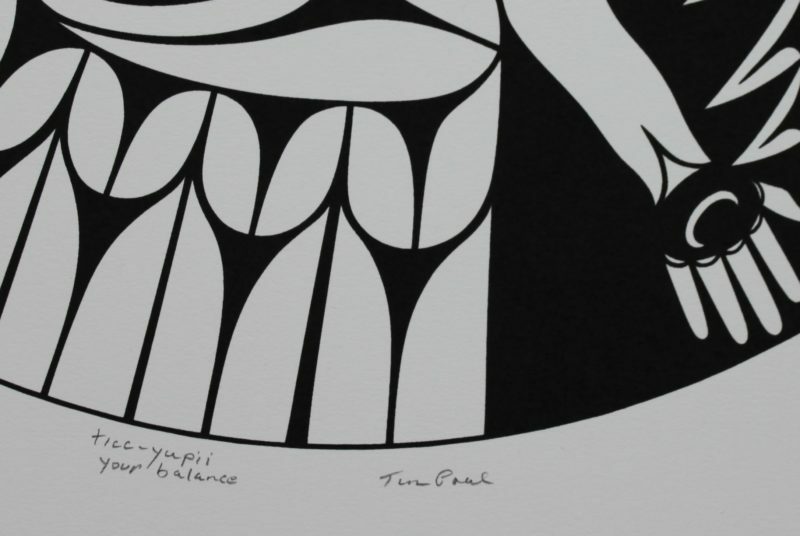 This limited edition silkscreen print titled "Ticc-Yupii" by Tim Paul was hand produced by the screen printing process. It is the only limited edition printing of this design. The artist has inspected and signed each copy in the edition. All trial copies of this edition have been destroyed and the printing stencils obliterated.